اکبریان, عیوض, نجفی, بهمن, جعفری قاسم قشلاقی, محسن. (1395). بررسی تاثیر زاویه آوانس پاشش سوخت آتش زن بر میزان آلاینده های موتور دوسوخته در بارهای مختلف. نشریه پژوهشی مهندسی مکانیک ایران, 18(4), 55-71. عیوض اکبریان; بهمن نجفی; محسن جعفری قاسم قشلاقی. "بررسی تاثیر زاویه آوانس پاشش سوخت آتش زن بر میزان آلاینده های موتور دوسوخته در بارهای مختلف". نشریه پژوهشی مهندسی مکانیک ایران, 18, 4, 1395, 55-71. اکبریان, عیوض, نجفی, بهمن, جعفری قاسم قشلاقی, محسن. (1395). 'بررسی تاثیر زاویه آوانس پاشش سوخت آتش زن بر میزان آلاینده های موتور دوسوخته در بارهای مختلف', نشریه پژوهشی مهندسی مکانیک ایران, 18(4), pp. 55-71. اکبریان, عیوض, نجفی, بهمن, جعفری قاسم قشلاقی, محسن. بررسی تاثیر زاویه آوانس پاشش سوخت آتش زن بر میزان آلاینده های موتور دوسوخته در بارهای مختلف. 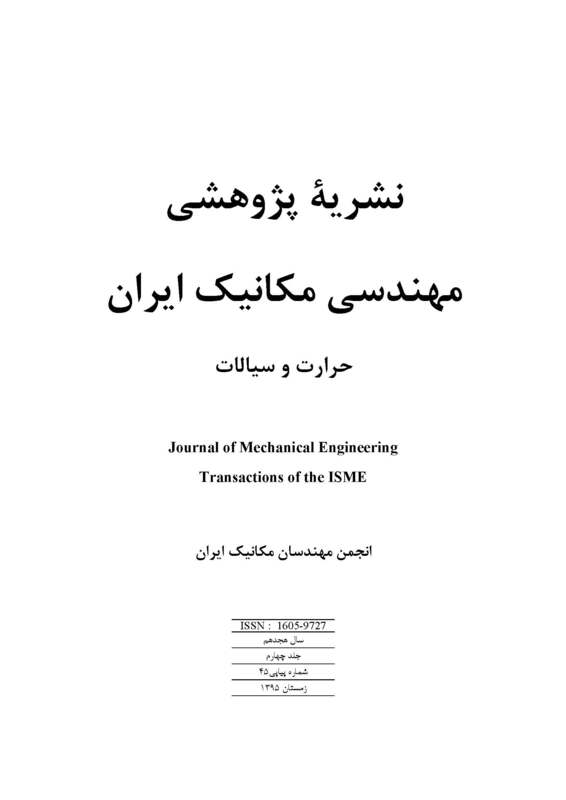 نشریه پژوهشی مهندسی مکانیک ایران, 1395; 18(4): 55-71. در این تحقیق که بر روی موتور تبدیل شده دیزل به موتور دوسوخته با دورثابت انجام شد،ابتدا عملکرد و آلاینده های موتور دیزل مورد تست و بررسی قرار گرفت و بعد از تبدیل به موتور دوسوخته،تحقیقات بر روی آلاینده ها در زوایای آوانس 14، 17و 20 درجه و بارهای مختلف%100، %75 ، %50 ، %25 و %10 بار کامل انجام گرفت.نتایج نشان داد که در بارها و زوایای مختلف میزان Noxو PM و CO2 در موتور دوسوخته نسبت به موتور دیزل کاهش می یابد. در بارهای کامل میزان Co کمتر و میزان HC موتور دوسوخته بیشتر از حالت دیزل بود. Bin, H., Huang, Y., Wang, F., and Xie, F., "Numerical Simulation of Cold Flow Field of Aero-engine Combustors for Lean Blow Off Analysis", ASME Turbo Expo. Power for Land, Sea and Air, GT 45467, Vancouver, British Columbia, Canada, (2011). Rankin, D., "Lean Combustion Technology and Control", Second Edition, USA, California, Elsevier, (2016). Bin, H., Huang, Y., and Jianzhong, X., "A Hybrid Semi-empirical Model for Lean Blow-Out Limit Predictions of Aero-engine Combustors", Journal of Engineering for Gas Turbines and Power, Vol. 137, pp. 501-510, (2015). Zukowski, E., and Marbel, F., "The Role of Wake Transition in the Process of Flame Stabilization on Bluff Bodies", AGARD Combustion,Vol. 28, pp. 167–80, (1955). Mellor, A., "Design of Modern Turbine Combustors", Academic Press, San Diego, CA, (1990). Longwell, J., Frost, E., and Weiss, M., "Flame Stability in Bluff Body Recirculation Zones", Ind. Eng. Chem, Vol. 45, pp. 1629–1633, (1953). Bin, H., Huang, Y., and Wang, F., "CFD Predictions of LBO Limits for Aero-engine Combustors using Fuel Iterative Approximation", Chin. J. Aeronaut,Vol. 26, pp. 74–84, (2012). Lefebvre, A., "Gas Turbine Combustion", Fourth Edition, Printed by CRC Press Taylor and Francis Group, (2016). Bin, H., Huang, Y., and Wang, F., "FIA Method for LBO Limit Predictions of Aero-engine Combustors Based on FV Model", Aerospace Science Technology,Vol. 28, pp. 435–446, (2013). Zheng, H., and Zhang, H., "Feature-parameter-criterion for Predicting Lean Blow out Limit of Gas Turbine Combustor and Bluff Body Burner", Mathematical Problems in Engineering, Hindawi Publishing , Vol. 2013, pp. 1-17, (2013). Ateshkadi, A., McDonell, V., and Samuelsen, G., "Lean Blowout Model for a Spray-fired Swirl-stabilized Combustor", Proceedings of the Combustion Institute, Vol. 28, pp. 1281-1288, (2000). Xie, F., Huang, Y., Bin, H., and Wang, F., "Investigation of the Relation between Flame Volume and LBO Limits for a Swirl-stabilized Combustor", IEEE Publication, pp. 2049-2053, (2011). Bin, H., Huang, Y., and Fang, W., "Improved Semiempirical Correlation to Predict Lean Blowout Limits for Gas Turbine Combustors", Journal of Propulsion and Power, pp.197-203, (2011). Davoudzadeh, F., and Liu, F., "Investigation of Swirling Air Flows Generated by Axial Swirlers in a Flame Tube", Asme Turbo Expo. Power for Land, Sea and Air, Barcelona. Spain. 8-11May, (2006). Anderson, J., "Computational Fluid Dynamics the Basic with Applications", Michigan State University, McGraw-Hill Inc, (1995). صنیعی­نژاد.، م.، " اصول جریان­های توربولانسی و مدل­سازی آنها"، انتشارات دانش­نگار، تهران، )1388(. Wilcox, D., "Turbulence Modeling for CFD", Third Edition, Dcw Industries, Incorporated, (2008). "Ansys Fluent User’s Guide", Ansys Inc, (2016). Dodds, W., and Bahr, D., "Combustion System Design in A. M. Mellor, Design of Modern Gas Turbine Combustors", pp. 343–476, Academic Press, San Diego, CA, (1990). Zabetakis, M., "Flammability Characteristics of Combustible Gases and Vapors", U. S. Department of Interior, U. S. Government Printing Office, Washington D. C, Bulletin 62, (1965). "Flammability Characteristics of Combustible Gases and Vapors", ISA Standard, ISA–TR12.13.01–1999 (R200X), Draft Technical Report, (1999).